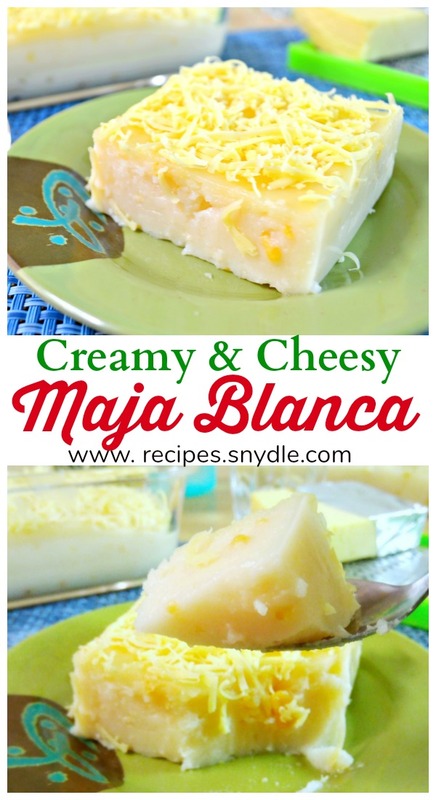 Maja Blanca is a very easy Filipino dessert dish. 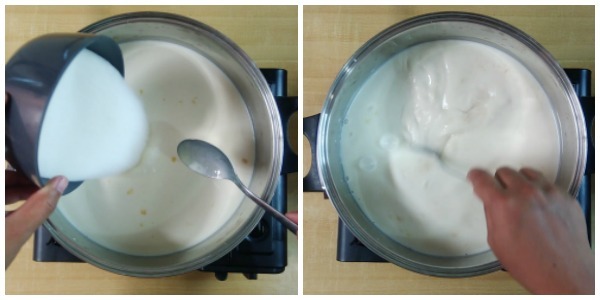 It is also known as “Coconut Pudding” and is made with coconut milk, corn starch and sugar. 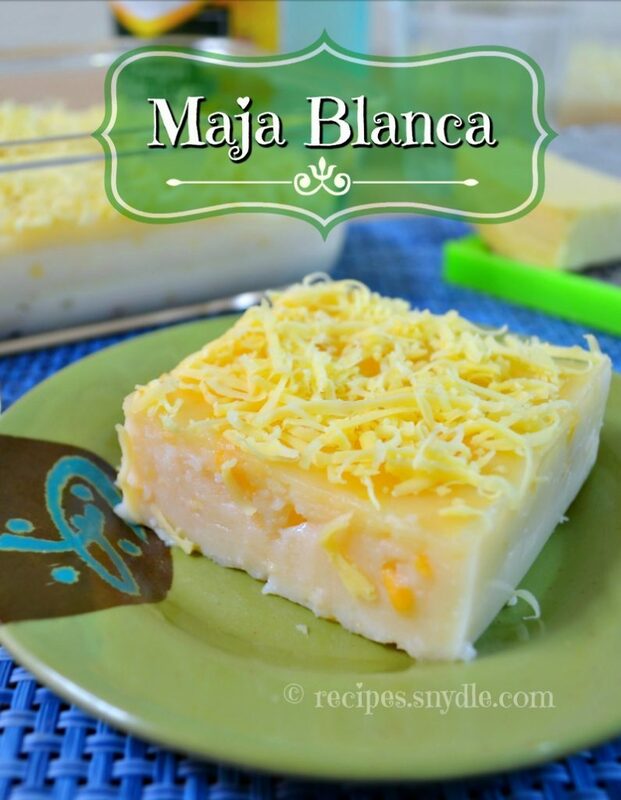 The first maja blanca did not include corn and milk, but these were added later to improve flavour and texture. 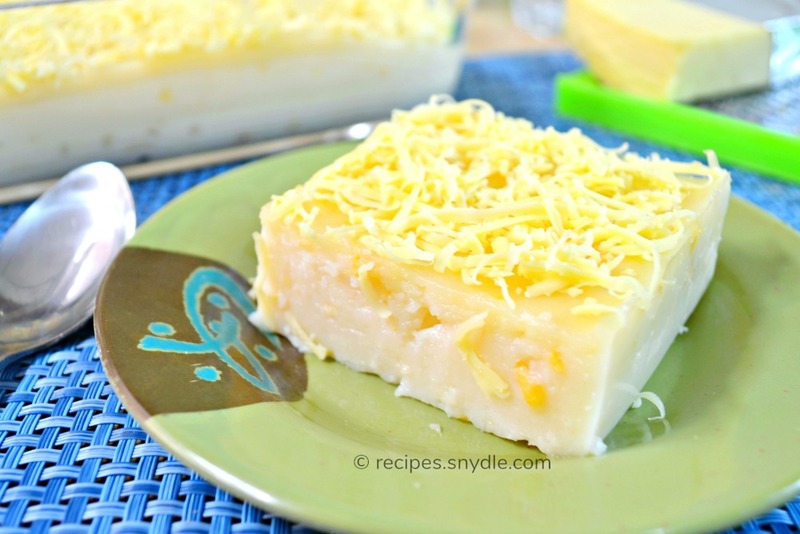 My mother used to make Maja Blanca during special occasions. I remember sneaking in the kitchen when no one was around and grab a spoonful of the Maja blanca my mother kept in the freezer. She used to top it with cheese curl crumbs. She then tells us to wait for a few hours before digging it. I don’t think the word “wait” is included in a child’s vocabulary. At least, it wasn’t included in mine and my siblings. I like having my maja blanca with corn. I also love topping it with grated coconut or cheese curl crumbs. When I feel a bit adventurous, I also add a bit of chopped bacon on top. The possibilities are endless! 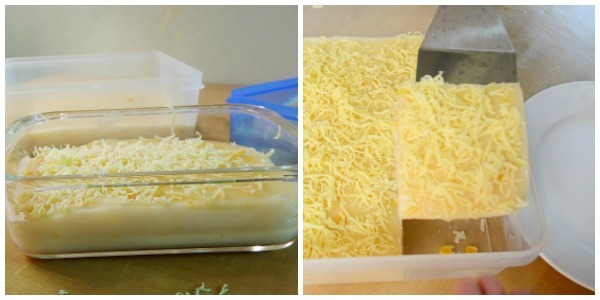 You can also use “latik” as toppings for the maja blanca. That’s usually the toppings you can find from those street-sold Maja Blanca. While that is the “traditional” toppings, you can try different ones as per your liking. 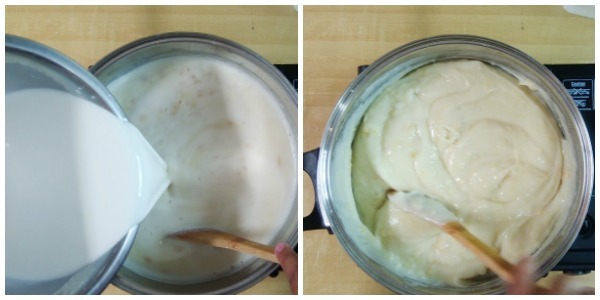 In a pot, mix everything except corn starch and reserve 1 cup of water. Mix well until sugar dissolves. Taste the mixture and see if the sweetness is per your liking. Add or reduce sugar as needed. Turn on the heat and let it boil in medium heat. 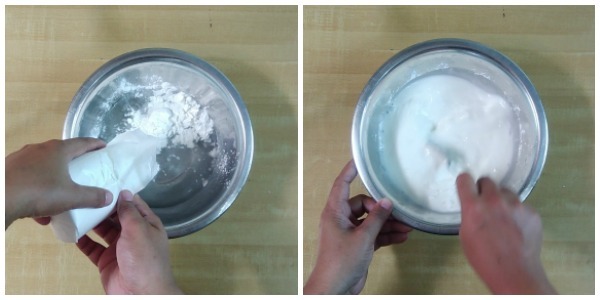 Meanwhile, in a bowl, dissolve cornstarch with the water you reserved (1 cup). Make sure that there’s no lumps. Set aside. Once the mixture is boiling, add in the cornstarch while whisking continuously and vigorously. Cook for at least 5 minutes while whisking in between to avoid burning and sticking in the bottom. Once cooked, transfer to a tray or dish. Set it aside and let it cool. Mix well until sugar dissolves. Taste the mixture and see if the sweetness is per your liking. Add or reduce sugar as needed. Turn on the heat and let it boil in medium heat. It’s up to you to adjust the sweetness. You may add or reduce the sugar as per your liking. 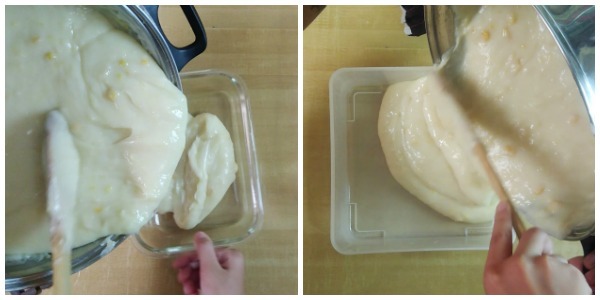 Taste the mixture first before adding the cornstarch. 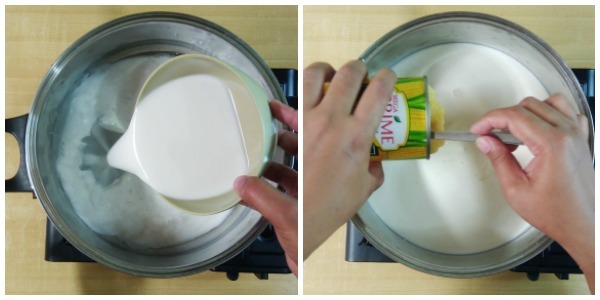 You can refrigerate this recipe and can last up to 4-5 days. You can use any toppings you want. It can be latik, cheese, peanuts or corn.